what they have to say about Stage Door! There's also an article about Principal Moll appearing in the new blockbuster The Great and Powerful Oz! Click here to see the article! Please remember that show DVDs and photo CDs are available for purchase. DVDs are $15 each or 2 for $20. CDs are $5 each. If you didn't get a chance to order yours, please email rodramaboosters@gmail.com and let us know what you'd like. If you would like to order on line, click the button below. They will be finished and ready for delivery soon after Spring Break. The final stage production of our 2012-2013 season is complete. Thank you to everyone who attended. We appreciate our audiences more than you know. 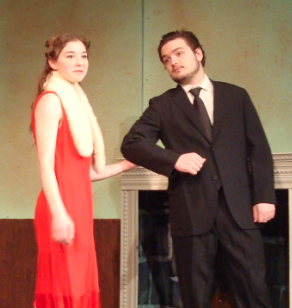 Congratulations to all of our Drama Club students for a wonderful production of Stage Door! You did a fabulous job, and we are all so proud of you. Thanks to all the parents who drove, sewed, built, cooked, served, sold and every other thing that was done to make this show a success. What a great team! 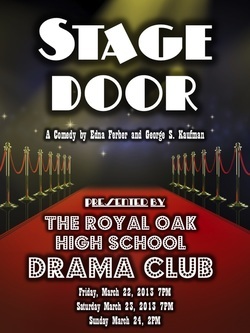 This is the place for Royal Oak Drama Club Students to find all the inside scoop on our Spring Play--Stage Door. Current Schedules, T-shirt order forms, Bio forms, Drama Club activity sign-ups; they're all here on the Stage Door Insider page! 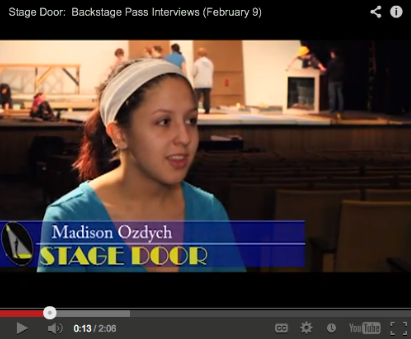 Click Here to see and hear from the cast and crew as they prepare for "Stage Door."